Who would want to be stuck in a dream for ten years? Everyone is afraid of something. Clowns, heights, peanut butter getting stuck to the roof of your mouth. But what if the source of fear existed within your own head? And what if you couldn’t move to escape from it? Rodney Ascher’s original and chilling documentary The Nightmare looks at the phenomenon of sleep paralysis, and finds that there is nothing as scary as our minds. Ascher opens with a fascinating revelation for language nerds such as myself. 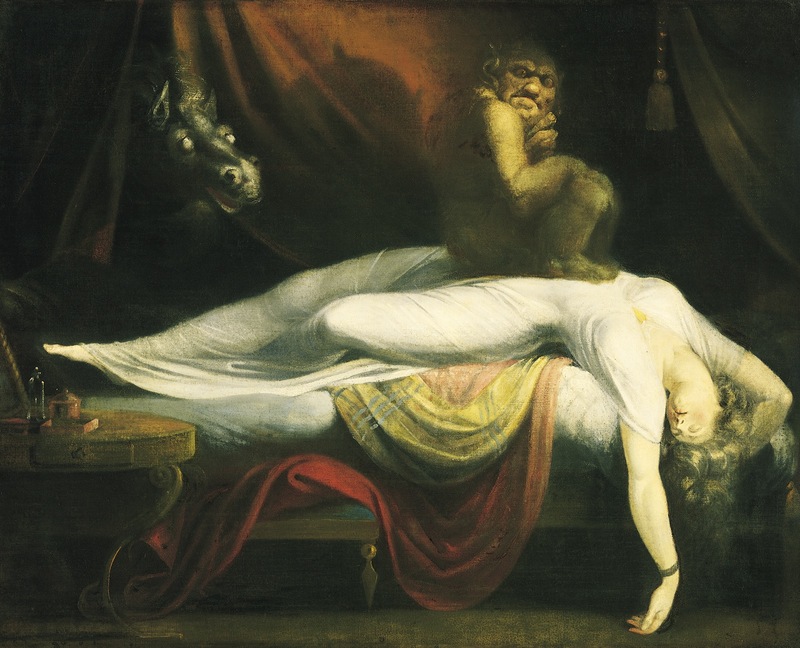 Separate from its current sense of a wholly foreign, fear-inducing dream, the term ‘nightmare’ used to have far more intimate, substantive meaning – it was the mare (Old English demon) that sat on your chest and pinned you down. This feeling of constriction is central to the experiences of the eight interviewees, several of whom speak of the powerlessness they suffer when their heads hit their pillows. As someone who has experienced sleep paralysis himself, Ascher uses gentle prompting and natural empathy to bring horrific stories from his subjects. Their diversity suggests something equally awful – this could happen to any of us. The real masterstroke is what Ascher does with the stories he solicits. Instead of endless talking or delving into the past of the sufferers, he recreates what they are saying with actors. The effect is not unlike that in Joshua Oppenheimer’s outstanding The Act Of Killing; by giving visual substance to spoken horrors, they become more real for the audience, and with that, more terrifying. These are not the cheap jump-scares or gruesome gore-fests of much modern horror. You believe the subjects are trapped in their minds, and by trapping us there too, Ascher shows sleep paralysis as both a fascinating and fearful phenomenon. It is metaphor for the film/viewer relationship itself, as by trapping ourselves in the confines of a screen, we open up a world of potential wonder but also woe over which we have no control. The film is structured into several sections, considering what the condition is, how it manifests itself, how people deal with it and what it means for their futures. I don’t want to cause any sleepless nights, but there is evidence of contagion; one subject describes how his first paralysed nightmare came shortly after his girlfriend told him she’d felt it, and he dismissed her claims. All is not lost though; when making the film the producers found people came to them as they were so keen to share their stories, and at Sundance earlier this year one viewer cried in relief at knowing they weren’t alone in having these visions. A tumblr has been set up where people can share their sleep paralysis experiences, and sharing them is bound to help lessen the burden. Or that is what I’m telling myself. Whether a sufferer, intrigued outsider or just a horror fan, there is so much to engage with here. For better or worse, you won’t forget this nightmare in a hurry. The Nightmare is currently showing at cinemas around the U.S., and is also available on iTunes, Google Play and Vudu.